The incredible singletrack acceleration and climbing efficiency feels more slack-angled XC racer than trail bike. Rear suspension suffers from stiction and is too firm off the top, making for an extremely bumpy ride. 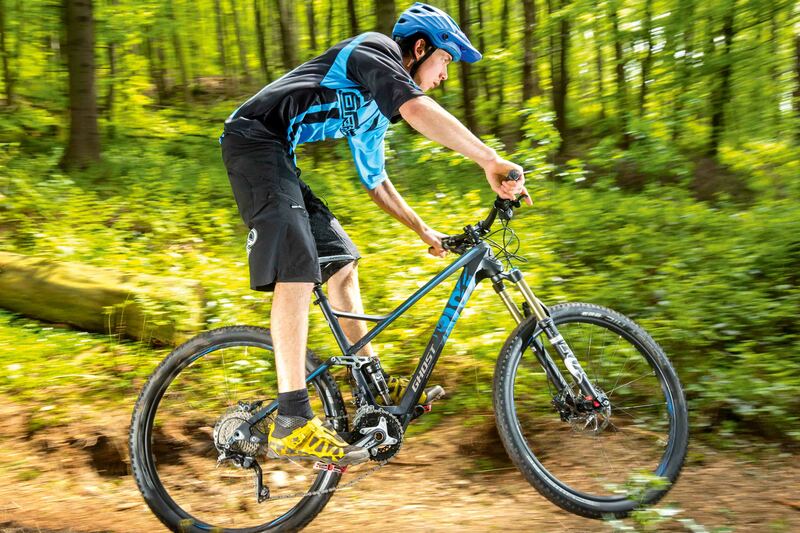 A trend I’ve noticed over the years testing models from Ghost is its trail bikes consistently deliver excellent suspension performance. This tends to be countered by a slight weight penalty compared to the competition that takes some urgency out of the overall ride quality. The latest Ghost AMR Riot Lector 5 shatters this idea. It’s a lightweight, rapidly accelerating, 130mm travel rig with more zip than a YKK factory and the raw speed of a pure XC bike. Presumably, the full carbon frame is at the root of this get-up-and-go attitude. 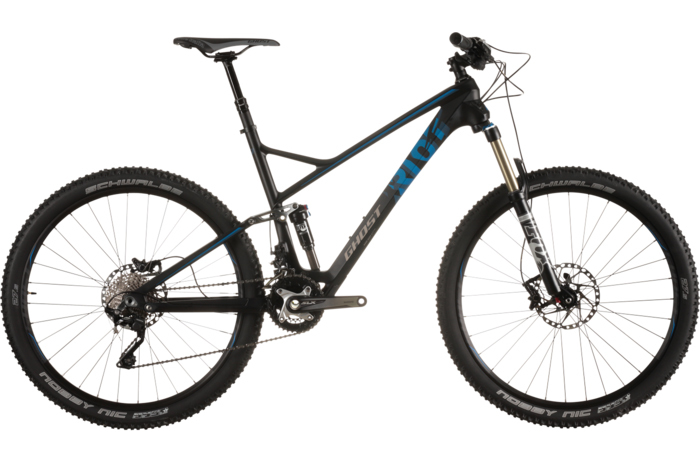 The newly designed chassis puts any overweight allegations to bed, as, even with a fairly standard parts package (open cartridge forks and mid-range Shimano kit), the Riot tips the scales at 12.8kg (28.2lb). To save weight, Ghost uses an aggressively sculpted profile with slim stays and also composite bushings (rather than heavier bearings) for the suspension pivots. While on the subject of suspension, there are more smart new features, including an extra forged lower link nestled in the enormous down tube/bottom bracket assembly, so the four-bar design works the shock from both ends — the upper rocker for the first 80 per cent of travel and the lower Riot-Link for the end stroke. And herein lies the rub. While pedalling and steering are direct and precise, the supple yet supportive Ghost suspension I expected is missing. 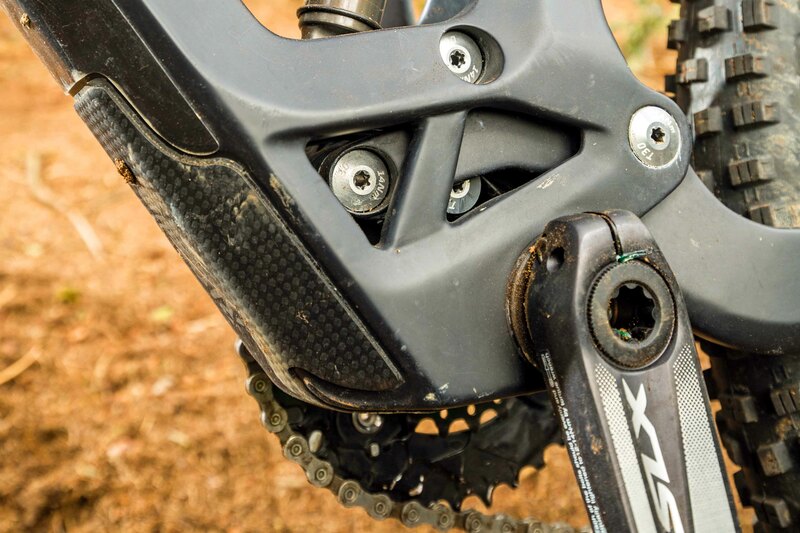 Instead of controlled tracking and good rider comfort, there’s a sticky, over-damped feel — and even with the Float CTD shock (that uses Fox’s lightest tune) run fully open, the rebound was too slow. This helps with the ruthless power transfer, but isn’t good for absorbing trail chatter or even small, square edges like tiny roots and rocks. Removing the shock and cycling the swingarm by hand, revealed considerable resistance, and this is likely a big contributor to the rough ride. This harshness of the rear suspension is a real letdown, as the Ghost has an awesome shape, rides great on smoother surfaces and demonstrates a knack for generating speed that’s rare in a trail bike with only 130mm travel. If switching to sealed bearing pivots made the tracking superior, adding weight might be a worthwhile trade-off, and enough to release the potential that seems to be lurking very close to the surface.